Margaret Terry Orr is an Associate Professor in the Educational Leadership, Administration and Policy Division of Fordham University. Previously, she was on the faculty of Bank Street College of Education, where she directed the Future School Leaders Academy, a two-year, dual certification leadership preparation program in partnership with 30+ school districts. 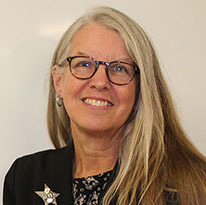 In her prior work, she was an associate professor of Educational Leadership at Teachers College, Columbia University and a senior research associate at the Academy for Educational Development (now FHI 360). Dr. Orr has conducted a great number of regional and national studies over the last 35 years on leadership preparation approaches and school and district reform initiatives, and has published numerous books and articles. Her books address effective approaches to leadership preparation and development. Her articles on preparation program effects demonstrated the influence of preparation on leadership practices and school improvement work.